We usually hit the bars pretty early and we usually see the place we end up to be pretty empty. Saturday was no exception. The disappointing feeling was that Missouri was set to play Illinois at 11:40 and there were hardly any Tigers fans. Oh well. The welcome sight of wall to wall big screens shepherd our way in as we set up shop near the corner of the place. The open air garage was perfect for bringing in this beautiful Kansas City September weather. We also dug the wireless internet as we Twittered like mad during the games. Last year, as you remember, Big Tony’s Touch Screen Poker held our fancy for a good while. Welp, Big Tony is gone and in its place we have Golden Tee Live 2010, Golden Putt, and Big Buck Safari. While were taking pics of the place and making the patrons nervous, we did note the one lowly dart board plopped right by where the waitresses bring out the food. 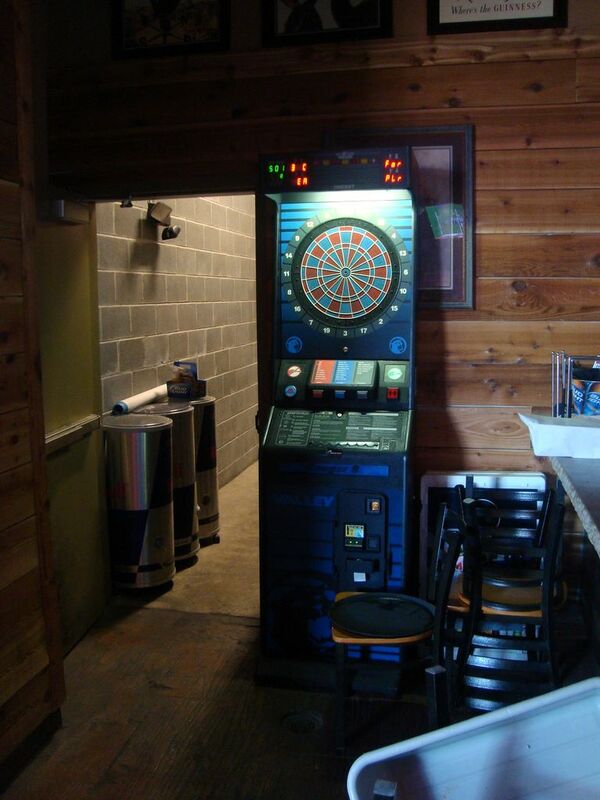 That is not the best location for a dart board. We can imagine a dart getting lodged into a plate of buffalo wings or heaven forbid a waitresses throat. Speaking of waitresses, this year’s crop at Johnny’s Tavern had a decent yield. The lady that served us wasn’t the best of the bunch but she was well attentive and hooked us up with our demanding television watching habit. The bartender girls put out all they can for tips and we can envision the tip bucket full by last call. Fortunately for us it’s jorts weather and all of the ladies were sporting our favorite clothing type at Johnny’s Tavern. Not a bad crop indeed. The food specials walking in alerted us to a cheese bread special for $5. We jumped on top of that and boy were we every glad we did. When the waitress brought out what looked like a pizza, we were baffled. 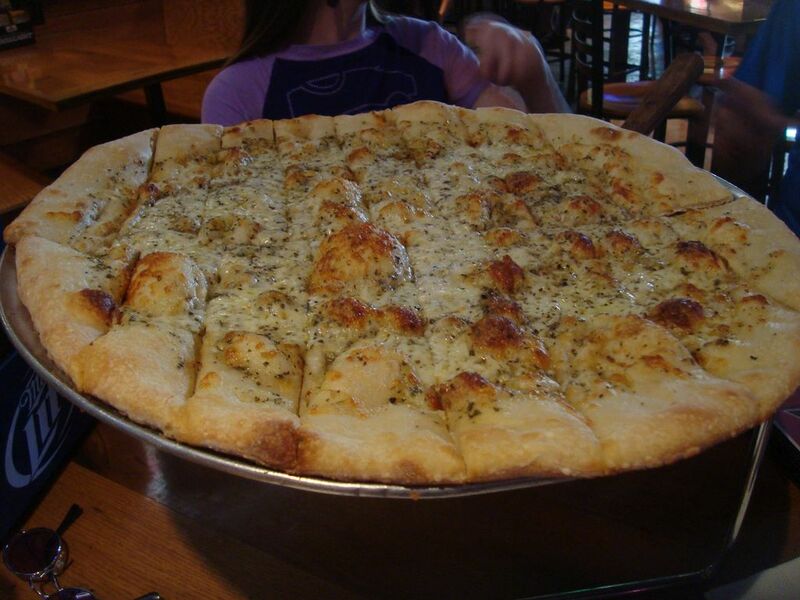 Once we got our heads together, we discovered that the cheese bread was essentially a cheese pizza. If you are at Johnny’s on a Saturday, pick up this special as it is well worth it. Now for something new. This year we are doing beer pairings. The idea of getting the right type of beer paired with a food offering is more popular than ever. For Johnny’s we opted for the pair of Octoberfest beer and the Johnny Wilson Chicken sandwich. Admittedly, the chicken was dry but the swiss and bacon helped make this sandwich worth the shot. You can’t find sweet potato fries just anywhere so we took the opportunity to snack them up as a side. The Samuel Adams Octoberfest brought a nice, round and nutty flavor to backup the light, grilled taste of the chicken. Both the beer and the sandwich gently reminded us that fall was right around the corner and that more football would be had. Now for the games. 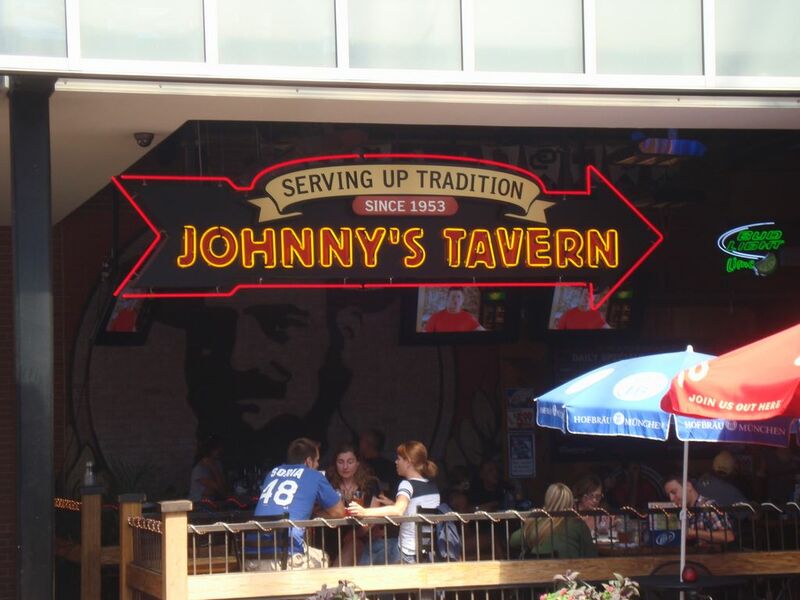 Nationally, there was not much in fanfare for our time at Johnny’s Tavern. The Big 10 morning menagerie ended up with blahs and blowouts for us. It looks like Florida took awhile to get started but ended strong. Florida State looked to be the strongest school out of that state with a massive blowout. That’s about it. Like we said, nothing really exciting. For the Big 12, the Arch Rivalry was first on tap. Blaine Gabbertt and company took some time to get started but warmed up in the second half over Illinois. Redshirt freshman Nathan Sheelhaas, a Rockhusrt high school grad, looked impressive to begin with for Illinois. But like every other Illinois quarterback, turnovers killed his momentum. Adjustments were key in this game as Ron Zook tried to take the Navy blueprint and surprise the Tigers. Tigers won the game as a nice send off for the Arch Rivalry and a good test to start the season. Next up was Kansas State hosting UCLA. Last year, Bill Snyder 2.0 took his rag-tag team to California and made it close until the 4th quarter. This year, Daniel Thomas takes the team on his back as the Wildcats looked for vengeance. The opening drive saw the Wildcats 3 & Out the Bruins then turn around and score off a Daniel Thomas touchdown run. The game was back and forth with some errors from Carson Coffman, but nothing too major. Prince and company kept the Bruins close late with two quick passes and touchdown. Daniel Thomas capped off his 200+ rushing yard day with a touchdown with under a minute to go. The Wildcats look pretty tough on the ground but could use some help on the passing side, both on offense and defense. The rest of the Big 12 saw Colorado spanking Colorado State. Texas also kicked off their new year with Rice whupping. Nebraska also walked in the park with Western Kentucky. Oklahoma held off a wily Utah State. Every other team in the Big 12 did their job and won handily, except Kansas. In Turner Gill’s opener, the Jayhawks actually lost at home to North Dakota State. The injuries in the offseason made itself known as Gill starts from the bottom to begin the year in football. Kansas will get better, no doubt, but we don’t know how much after this loss. 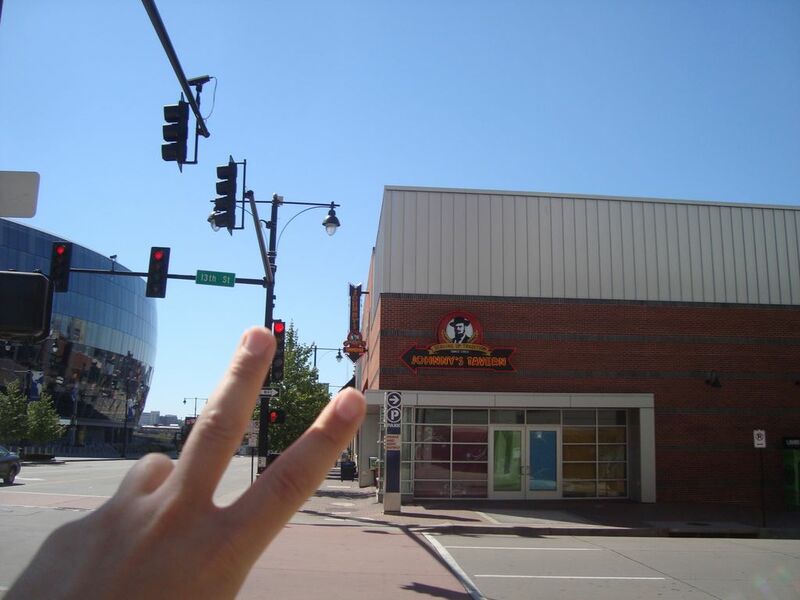 The price tag for the Power & Light District scares away the regular folk like us when we go looking for a good time. Fortunately enough, between all of the franchise plastic places, there sits a local faire that we recommend to everyone we talk to. The food is cheap enough to enjoy, especially for the specials. 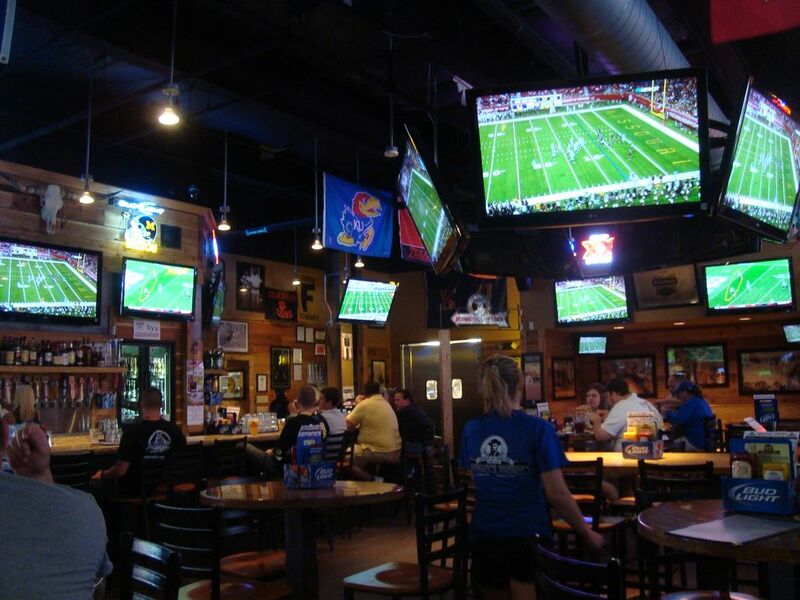 There’s plenty of televisions and internets to keep you updated on all of the games. The waitresses are good enough that they don’t harsh your buzz. All in all Johnny’s Tavern at the Power & Light District is still a real good time. They are on the board for number one for this year’s best Barspot.